A Free Online Course of the Sri Hanuman Chalisa. Welcome to the only course offered on-line that teaches authentic and accurate pronunciation and musical chanting of this much beloved chant, the sacred Sri Hanuman Chalisa. Learn from Naren K. Schreiner and Lopamudra Bose in an easy, step-by-step video course that also offers audio practice recordings and a PDF of the entire text. The course is divided in 8 lessons, the first 6 covering the entire Chalisa word for word and verse by verse. Lessons 7 and 8 concentrate on the music, teaching a traditional melody for voice and harmonium, and in two keys that fit the scale for women's and men's voices. Unlimited access to 8 videos, totaling nearly 2 hours. 2 digital downloads of practice recordings to listen in the car or at other times for practice. A PDF of the complete Sri Hanuman Chalisa with Devanagari script, English transliteration, and English translation. Your contribution makes it possible for us to offer this course free of charge to devotees worldwide. If you haven't already heard Hanuman Chalisa on Naren's latest album, click here for iTunes or Amazon. Naren is a teacher and musician of India’s sacred traditions. He began his spiritual search at a young age and became a monk of the Self-Realization Fellowship Ashram. For 14 years he studied, served the SRF mission, and lived the pure, disciplined life of a monk. During those years he especially concentrated on India's spiritual heritage, yoga sadhana and devotional chanting. He learned Indian bhajans and the swarsadhana foundations of dhrupad music. In 2010 Naren, with the support of his spiritual counselors, chose to leave the ashram and expand his lifework and spiritual search. During his pilgrimage to India that year, Naren was invited to be a resident guest scholar at the ITC-Sangeet Research Academy in India, where he studied with maestros of classical music, concentrating on the foundations of bhavsangeet. 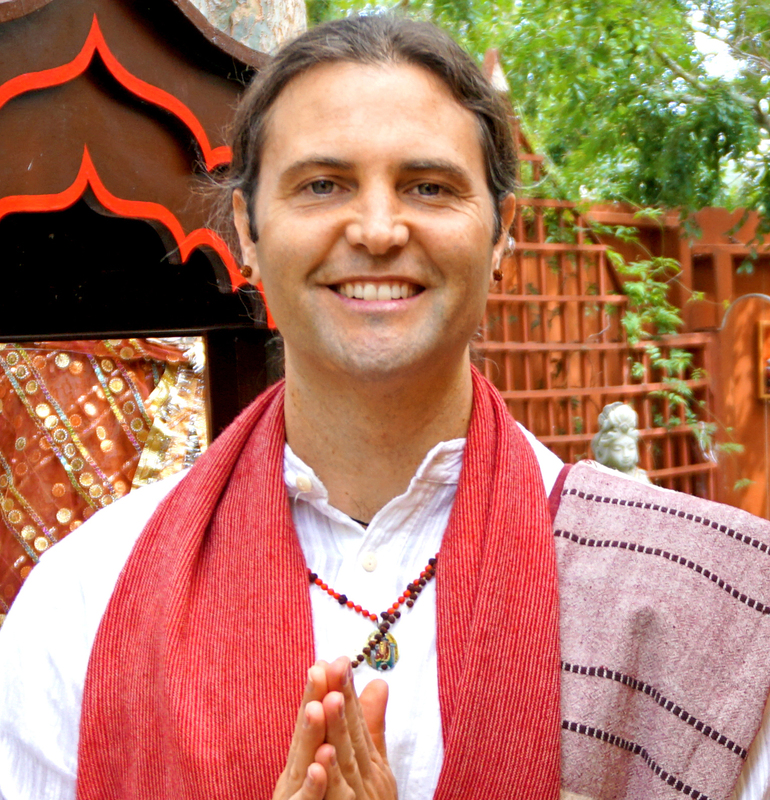 In 2012 Naren founded Sangita Yoga, through which he teaches and offers sacred music and rituals in various spiritual centers, universities, cultural and interfaith centers throughout US and México (Naren is fluent in Spanish). He also released three albums of Indian sacred music. Naren continues to deepen and expand his spiritual understanding and practices under the guidance of Swami Bhajanananda Saraswati at the Kali Mandir, where Naren serves Ma as a pujari (priest). Lopamudra has been a part of Sangita Yoga since its inception, working on translations, teaching language, and offering cultural guidance and inspiration. Her passion to preserve the traditions of her homeland brings a special quality and grace to Sangita Yoga. Born in Kolkata, India, she was naturally drawn to the sacred art and culture of her homeland. Her degree in Philosophy from University of Calcutta reflects her deep interest and study of the spirit. As an ardent devotee of Kali and a disciple of Paramahansa Yogananda, Lopamudra has practiced yoga meditation and chanting of Sanskrit prayers and mantras for most of her life. Later studied interior design and started a residential design business. Her career expanded to other areas of commercial design and art and is now enhanced by the study of Vāstu, India's architectural science. Lopamudra has recently started Sattvikam, a learning resource for pure, delicious, sattvic Indian cooking, which has always been one of her passions. Naren es un maestro y músico de las tradiciones sagradas de la India. Él comenzó su búsqueda espiritual a una edad temprana y se convirtió en monje del Ashram del Self-Realization Fellowship. Durante 14 años estudió, sirvió a la misión del SRF y vivió la vida pura y disciplinada de un monje. Durante esos años se concentró especialmente en la herencia espiritual de la India, el yoga sadhana y el canto devocional. Aprendió bhajans indios y el swarsadhana la antigua forma de música dhrupad de la India. En 2010 Naren, con el apoyo de sus consejeros espirituales, optó por dejar el ashram y expandir su obra de vida y búsqueda espiritual. Durante su peregrinación a la India ese año, Naren fue invitado a estudiar como residente en la ITC-Sangeet Research Academy en la India, donde estudió con maestros de música clásica, concentrándose en las bases de bhavsangeet. En 2012 Naren fundó Sangita Yoga, a través del cual enseña y ofrece música sagrada y rituales en varios centros espirituales, universidades, centros culturales e interreligiosos en diferentes ciudades de Estados Unidos y México (Naren habla español). También tiene tres álbumes de música sagrada la India. La misión de Sangita Yoga es ofrecer la experiencia de las tradiciones sagradas de la India y ser un recurso auténtico y accesible para el aprendizaje. Naren continúa profundizando y ampliando su entendimiento y práctica espiritual bajo la guía de Swami Bhajanananda Saraswati en el Kali Mandir, donde Naren funge como pujari (sacerdote). Lopamudra ha sido parte de Sangita Yoga desde sus inicios, trabajando en las traducciones, enseñando el Idioma, pronunciación, y ofreciendo orientación cultural e inspiración. Su pasión por preservar las tradiciones de su tierra natal, aportan una calidad y gracia especial a Sangita Yoga. Nacida en Calcuta, India, fue naturalmente atraída por el arte sacro y la cultura de su tierra natal. Su licenciatura en Filosofía de la Universidad de Calcuta refleja su profundo interés y estudio del espíritu. Como ferviente devota de Kali y discípula de Paramahansa Yogananda, Lopamudra ha practicado yoga, meditación y el canto de oraciones y mantras sánscritos durante la mayor parte de su vida. También estudió diseño de interiores y comenzó un negocio de diseño residencial. Su carrera se expandió a otras áreas del diseño y el arte comercial y ahora se ve reforzada por el estudio de Vastu, la ciencia arquitectónica de la India. 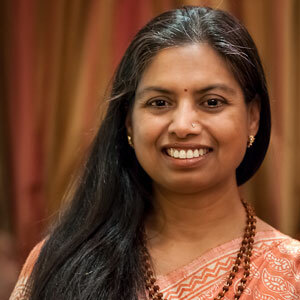 Lopamudra ha comenzado recientemente Sattvikam, un recurso de aprendizaje para la cocina pura, deliciosa y sattvica de India, que siempre ha sido una de sus pasiones. THe course is organized in a well structured format where you can easily learn the pronunciation correctly. This is the best melody of Chalisa that I've ever heard . Nice instrument and nice voice! Love it! Simple, straightforward and lovely! Thank you! I have longed to learn the Hanuman Chalisa for many years. You have put together a magnificent system to teach westerners the chalisa with proper pronunciation. I cannot thank you enough. I know that it will take a long time to learn it by heart. That’s ok with me. I want to carry it with me for a lifetime. Thank you again for providing this free lesson for the bhaktas of the world. May god and Gurus forever bless your steps. Highly recommend this for anyone serious about learning the chalisa. This is a great way to get started learning this sacred prayer to Sri Hanuman. I recently had the opportunity to chant this with KD at Kainchi Dham in India and was a little embarrassed that I hadn't spent more time working on the lyrics. I have struggled with how to pronounce the lyrics and this course really helped me to get more confident. It's important to get the pronunciation right so you are not committing to memory things you will have to eventually unlearn. I like the simple but traditional melody that is included toward the end. I appreciate that it's free also. It's a prayer after all. But it took time and effort to plan and produce and I appreciate it! Thanks! With the help of Naren, Lopa and the Sangita Team not only has it been simple and easy to follow but greatly enjoyable learning such a sacred chant with accurate pronunciation. As I continue in my study of the Sri Hanuman Chalisa I am positive that it will help to bring more joy, devotion and wisdom into my life and sadhana. Jaya Sri Hanuman! Jaya Sangita Yoga! It is technically accurate, visually beautiful and above all filled with bhakti. It will have your heart smiling and your soul singing! I was really excited when I came across a Facebook post saying that it was possible to learn the Hanuman Chalisa with detailed attention to the pronunciation ... and the perks of a harmonium lesson and a skype lesson just made it all the more exciting :) It took about three months to give my full attention to the videos and teachings, and although it was a bit challenging for me, I was helped by the gentle reminders I received via email to not give up! And so I didn't ... Naren and Lopa are wonderful guides and patient teachers. With some self-discipline and practice, they make it possible to learn the Hanuman Chalisa because it's as if they're holding your hand while you're learning it. Jai Hanuman! I'm in awe at how well done the course was delivered, and the quality of the recordings. I can really feel the time and effort spent. Very grateful to have come across Naren and Lopa, the sincerity and purity are very tangible and comforting. Learning and being shown how to chant the hanuman chalisa on the harmonium in the last video is not something I expected when I signed up for the course, this was a very welcomed surprise and blessing for me! Jai Shri Ram. The Sangita Yoga Sri Hanuman Chalisa course is an excellent investment of time for those interested in learning this ancient scripture. The course breaks the 40 verses into manageable segments that are then taught for accurate pronunciation and rhythm in individual lessons. Full review of each segment at the end of each lesson, paired with a slow practice audio download offered in Lesson One, support regular, ongoing practice. Naren and Lopamudra pair up to provide a clearly understood, well paced course of study. I see that the course ends with application to harmonium and singing of the chalisa, but have not yet reached those lessons. One suggestion: I do wish that verses being taught were sung at the start (or end) of each lesson, as the Doha (invocation) is in Lesson One. I would appreciate being able to put each lesson directly into full, sung practice. For me, this is where the devotional aspect of this chalisa is conveyed best. Grateful for your service to devotees of Hanuman through this excellent course. This is an incredibly thorough, well thought out, and enjoyable video. A great introduction. I'm definitely recommending this to anyone who wants to learn to play harmonium and/or sing. Great course! Excellent teaching methods and easy to learn. Would like to learn various Bhajans and kirtans on line. Loved the course, Naren and Lopa make it easy to learn and also give encouragement at every step of learning. Thank you.